Governor Jerry Brown signed Senate Bill 54 last Thursday, a bill to limit local law enforcement’s cooperation with immigration authorities. Though the so-called sanctuary state bill was amended to appease law enforcement officials — at the governor’s behest — the changes were not enough for Santa Barbara County Sheriff Bill Brown. “We’re disappointed,” he said. Though Sheriff Brown described the modified bill is “less of a problem,” he said the law will still be problematic for public safety. Santa Barbara County has almost become ground zero. 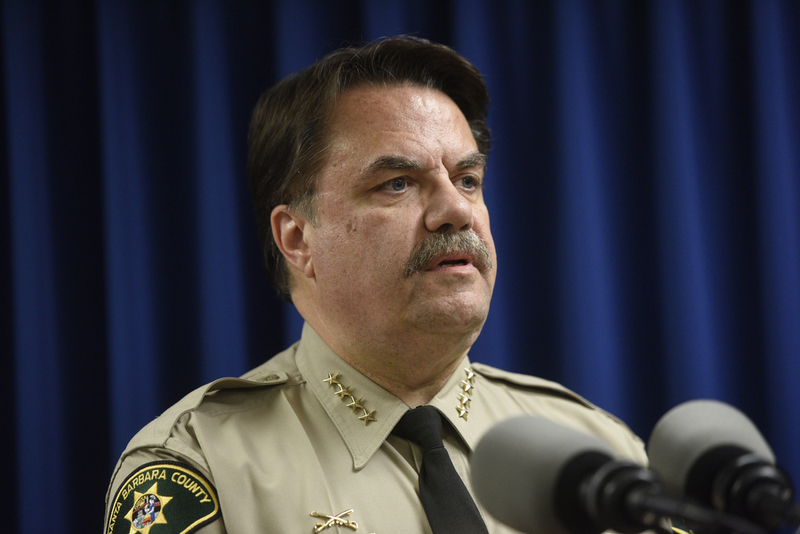 Sheriff Brown serves as president of the California State Sheriffs’ Association. Recent analysis by a Syracuse University nonprofit found Santa Barbra County is 25th in the nation in hold requests filed by immigration authorities. In 2016, ICE requested notifications for 600 inmates, according to Brown. Of those, ICE agents were waiting to pick up 258 individuals when they stepped foot out of County Jail. With facilities in Camarillo and Santa Maria, ICE has more resources in the county than other areas. On Friday, ICE acting director Thomas Homan said in a statement that SB 54 undermines “public safety and hinders ICE from performing its federally mandated mission.” He declared ICE agents would be forced to conduct targeted enforcement raids in California neighborhoods. “This is exactly what we warned would happen,” Sheriff Brown said Friday. Earlier this year, when he spoke before the Assembly Judiciary Committee, Brown argued ICE agents who arrested suspects in county jails are much safer than in homes. What’s more, these targeted enforcement raids can result in undocumented bystanders in the wrong place at the wrong time to also be arrested during a sweep. “I’m sorry but not surprised,” Sheriff Brown said. Effective in January, the law prohibits Sheriff’s Offices from notifying agents with ICE (Immigration and Customs Enforcement) when foreign-born criminals will be released from jail — except in “serious” or “violent” cases. These used to be called ICE “holds,” but California outlawed sheriffs from holding any inmate longer than their local sentence. But Sheriff Brown — a longtime acquaintance of Governor Brown — argued the exceptions were too narrow. Even after the bill’s modifications, Brown said even “some felonies and most high grade misdemeanors remain our chief concern, and they should be further addressed legislatively.” These include multiple DUIs, weapons charges, domestic violence charges, animal abuses, assault on peace offices, and many others, he said. Last month, Sheriff Brown faced sharp criticism for his opposition from Santa Barbara activists with CAUSE (Central Coast Alliance United for a Sustainable Economy) and faith-based leaders during a town-hall forum at the Unitarian Society. As a practical matter, the law also prohibits county jails from providing office space to ICE agents. ICE, however, under the new law will still be able to interview foreign-born inmates (unless they refuse). The law also blocks police officers or sheriff’s deputies from asking about a person’s immigration status. Law enforcement agencies and ICE can still work together on official task forces.